Which web browser is the safest? Current trends show over 50% of malware infections occur via Internet download. During Q1, 2009 NSS Labs performed the industry’s first comprehensive test of web browser protection against socially engineered malware. This report examines the ability of six different web browsers to protect users from this leading threat. The results are based upon empirically validated evidence gathered by NSS Labs during 12 days of 24x7 testing of more than 154,000 individual tests. Microsoft Internet Explorer 8 (RC1) was the standout in our tests, achieving a best-in-class 69% catch rate against Malware. It is clear that Microsoft is making an effort to provide security to their customers with IE8. 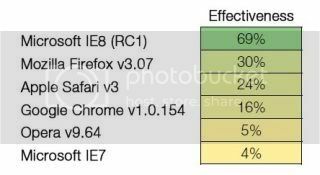 With a catch rate of 30%, Mozilla Firefox was a distant second to IE8, but commendable nevertheless. Apple Safari achieved a respectable 24% catch rate, However, test results indicate operational delays in distributing protection filters, leaving Safari users unprotected for long periods of time. Google Chrome’s protection was notably inconsistent. Initial protection was commendable, however as the test progressed, Chrome’s protection faded dramatically – bringing down the average catch rate to 16%. We were concerned that this was somehow an artifact of our test harness and spent extensive time manually verifying results. Our findings were that Chrome’s protection did indeed drop off significantly. With a 4% catch rate, Microsoft Internet Explorer 7 provided practically no protection against malware. You know, the market is down for the year but on it's way up, and MS is about to release two great products. I am going to buy some MS stock today!!!! I think IE 8 RC 1 was a little better than IE 8, it seems a paradox I know. What's that? Firefox's effectiveness is only 30%? I can't believe this? Anyway, good to see that IE8 has got the first place. Incidentally, Google had also released a Browser Security Handbook in Wiki format a couple of months ago. It covers IE6, IE7, FF2, FF3, Safari, Opera, Chrome, Android, and not IE8. Thanks for the link, leofelix. You get 100% security when you cut the ethernet cable - but then you don't need any browser except for playing with .gif files. If I have to study 500 add-ons to find the 5 that will make me safer, I rather go with the product that provides that in it's vanilla version. I hope so but to be honest I do not think so. I could test new IE 8 way to detect malicious website, I think MS should work hard to improve it. And why should I give up Spybot Search & Destroy, JavaCool SpywareBlaster protection and a good patched HOSTS file in return of IE 8? I do not see any reason at present. I use and reccomend Firefox with "no script", thank you for remembering it and what else? WOT maybe? Last edited by leofelix; 26th March 2009 at 03:24. Indeed, WOT! However, I would point out that WOT is not just for Firefox. It is also recommended for IE.